This is the big one, and what a story! 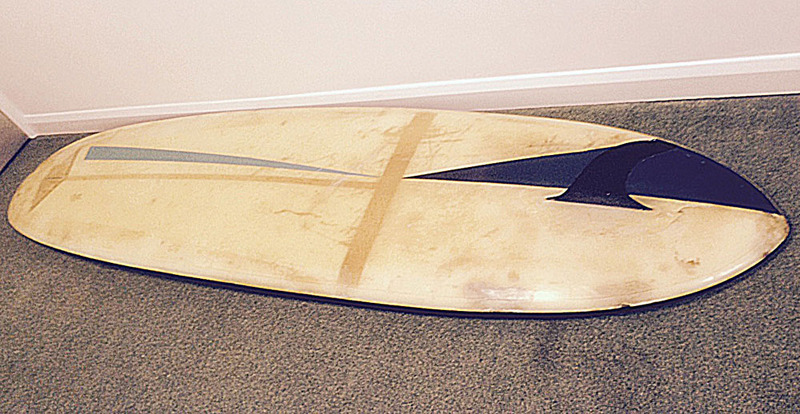 This original 1967 Tiki surfboard was originally donated by its shaper, and Tiki co-founder, Tim Heyland as a prize for the Museum of British Surfing’s 2014 surf heritage raffle – then in an amazing act of generosity, Mat Bailey who won this rare old beauty following the draw in December, donated it back to the museum so that we could auction it to raise funds to support our work as a charity in UK surf heritage! We’re blown away & we hope you’ll do us all proud and bid high to give this old girl a loving new home. You can take part in the auction by clicking here. The auction ends on February 2nd 2015 at 6.58pm. In the photos below you can see Tiki’s Tim Heyland (left), Matt Bailey (centre) and surfing museum founder Pete Robinson (right). Tim confirmed that this was one of the first surfboards they ever made when Tiki first started up in Abergavenny in 1967 with the most rudimentary of tools (a brick was mentioned)! 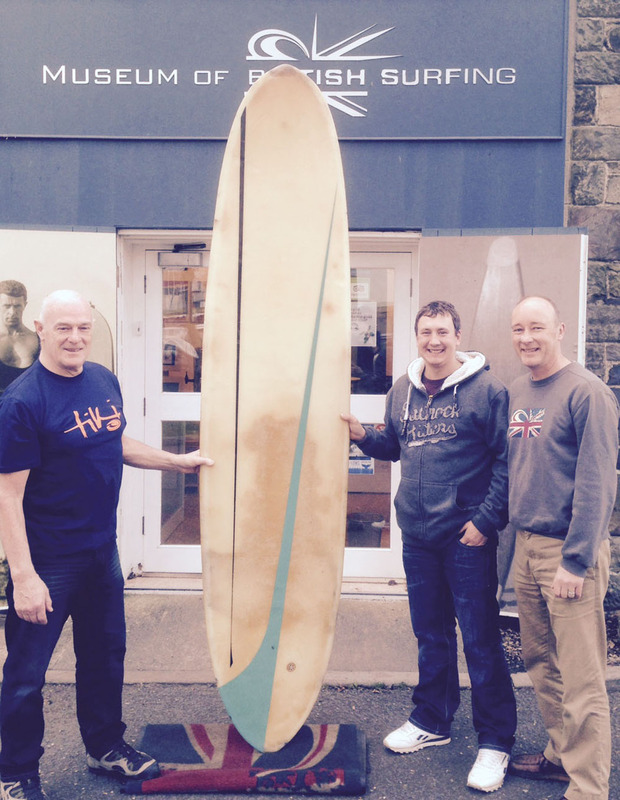 Tiki moved to Braunton the following year, where they remain today as one of the UK’s longest running surf companies. The logo is a rarity in itself, as it says ‘Abergavenny, England’ – in case you didn’t know, it’s in Wales… 6 miles from the English border! We’ll let you ask Tim for that story yourself! The board is a ‘transitional’ shape from the era when surfboard lengths first started to come down from the 9-foot plus ‘Malibus’ of the 1950s & early 60s. At the time it would have been one of the first of these ‘new, modern’ designs in Britain – they had been tried out in Australia, Hawaii and California that year. 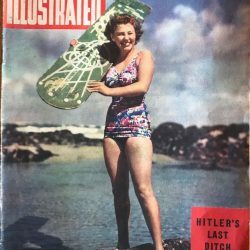 Both Tim Heyland and Tiki co-founder Dave Smith travelled widely at the time meeting key surfers and shapers and bringing new ideas back to Britain. 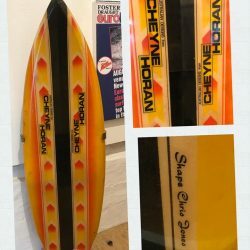 Several vintage surfboard collectors who have seen the board ‘in the glass’ have been drooling over the design and believe it will be a great rider! We have carried out some sympathetic conservation work carried out. Old paint was carefully cleaned off, and open dings repaired. The fin had been removed at some point in its life, but an exact template from a Tiki from the same batch has been made and glassed on as it should have been. The coloured stripes and decal are all original. The deck shows signs of delamination on the lower third. This is common in stringerless transitional boards, and we would recommend that it is left as is. The board has a lovely patina which reflects its 48 years of life. A previous owner added a leash plug which has been filled with clear resin. 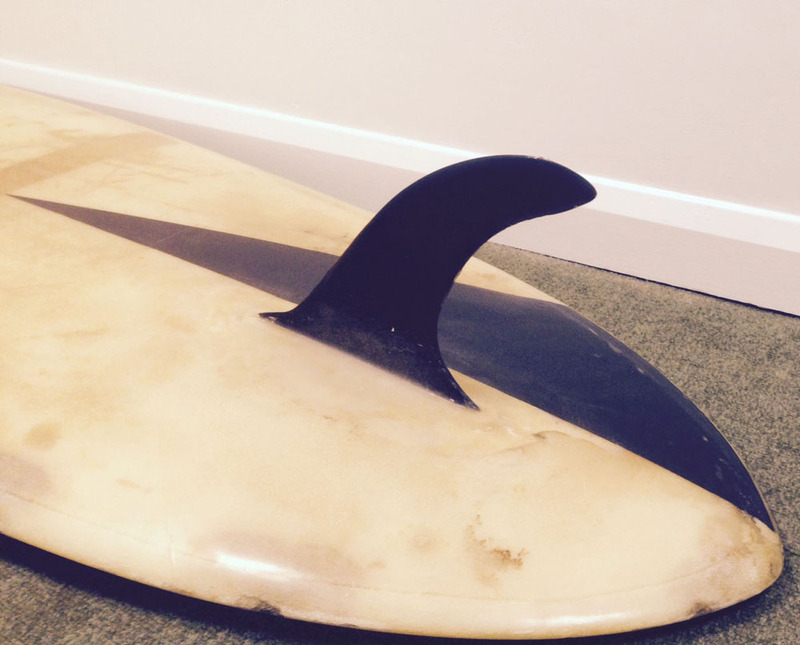 This is a unique opportunity to acquire a genuine piece of British surfing history, and we’ll try to hook the winning bidder up with Tim Heyland when you come to collect the board so that you can hear its story direct from the man himself. Ride it, hang it on your wall – but most of all love and cherish it. 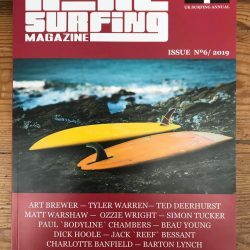 The winning bidder will also receive a personal tour of the Museum of British Surfing in Braunton with its founder Pete Robinson (time to be arranged). Dimensions are approximately 8′ 4″ x 23″ x 3 1/4″. 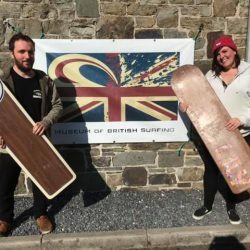 The Museum of British Surfing is a registered charity (1131433) based in Braunton, North Devon and is open from Valentine’s Day 2015 with our British surfing pioneers exhibition ‘The First Wave’.